Words must used and understood by a wide audience before they are considered by the Oxford English Dictionary. New dictionary additions must be widely "used and understood"
London (CNN) -- OMG! It is no longer a just a teenage expression, but officially a word found in the dictionary. "FYI" (for your information), "LOL" (laughing out loud) and "OMG" (oh my god) are all now formally recognized by the Oxford English Dictionary, one of the world's principal English-language dictionaries. These terms may have resulted from the character limits in texts and tweets, but have since been adopted as commonly used expressions in everyday speech and print. Graeme Diamond, chief editor of new words for the Oxford dictionary, explained what it takes for a new word to make the grade: "You have to show that the word has been in usage for a decent length of time and, most importantly, that the word is used and understood by a wide audience." One new entry to the Oxford dictionary is "WAG" -- an abbreviation for "wives and girlfriends" used to refer to the partners of soccer players. "WAG burst out of nowhere," Diamond said. Introduced by a British newspaper article in 2002, it lay dormant for four years. Then, with huge media attention on England's footballers during the 2006 World Cup, "WAG" became a commonly used and understood expression. 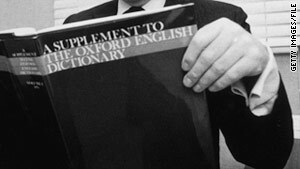 The Oxford English Dictionary heralds itself as "the last word on words for over a century" -- and, with four updates each year, it certainly keeps up and keeps "hip" (slang), with the English language. Take the word "heart" for example. A new "sense" was added to it as a verb, recognizing slogans with "I (heart) ..."
According to a statement from Oxford, "it it may be the first English usage to develop via the medium of T-shirts and bumper-stickers."